What is the customs process in Switzerland to import? How is import cargo released from Switzerland Customs to importer? Who are the parties involved in import customs clearance formalities in Switzerland? Import cargo clearance in Switzerland Customs. The Federal Customs Administration is the official customs department of Switzerland. They are responsible for levies taxes and duties on goods efficiently, implementation of customs policies, facilitate legitimate trade and protection of the society and legal economic activities. The UID number must be expressed in commercial or proforma invoices when issuing an import or export customs declaration in Switzerland. 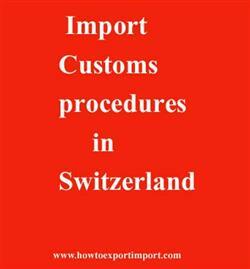 The information provided here details on how to import goods to Switzerland especially import customs clearance procedures in Switzerland. Import customs procedures required in ZURICH. Import Customs process in GENEVA. Process to import to BASEL. Requirements of customs to import to ZURICH. Customs requirements in GENEVA to import. Customs needed to import to BASEL. How can I clear customs to import in ZURICH. What Customs formalities required to import in GENEVA. What should I do to import goods in BASEL. How to get import customs permission in ZURICH. What is said to contain in Bill of Lading. How to import to India from Guinea? How to export from India to Switzerland? How to apply for GSTIN by new applicant?